We have a new campaign to honor moms for Mother’s Day 2016 with place names on its Mars map or subscriptions to its daily emailed space image service. 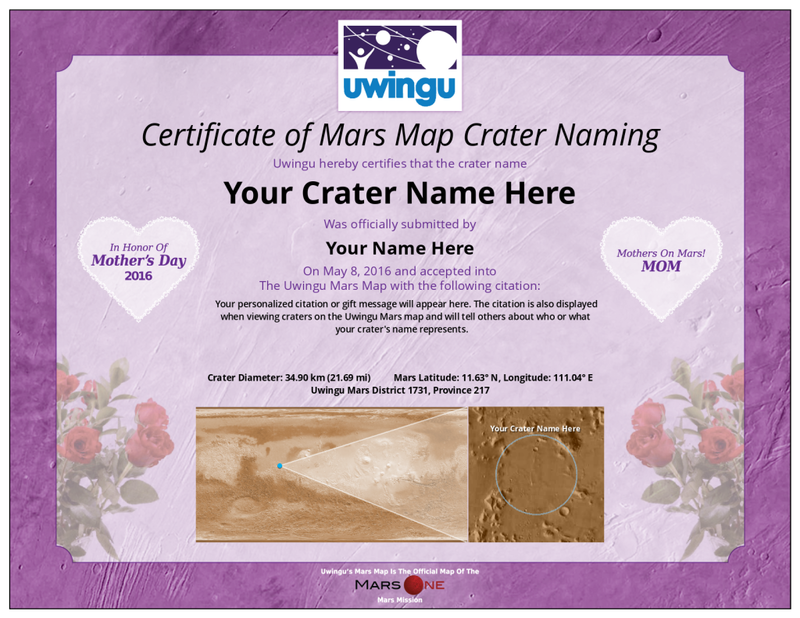 Today through Mother’s Day on May 8th, Uwingu is offering decorative Mother’s Day certificates for anyone choosing to honor a mom with a named crater on our Mars map. Two certificate options are available: an electronic downloadable version and a beautifully printed and framed keepsake version. Uwingu’s Mars Map will be carried to Mars aboard both the first Mars One robotic lander and also on the Time Capsule to Mars Project. Orders for framed certificates must be made by May 2nd to ensure arrival by Mother’s Day. Prices for naming craters depend on the size of the crater, and begin at just $5. Half of Uwingu’s revenues from all its products go to fund the Uwingu Fund for space research and education grants.